The Emperor of All Maladies [Book Review] – my books. my life. 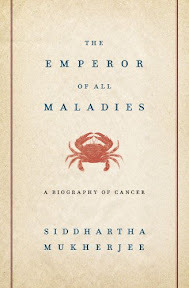 The Emperor of All Maladies is sub-titled “A Biography of Cancer.” It is really a history of our battle against cancer. Mukherjee, a physician, has the medical knowledge and writing ability to succeed in this narrative of cancer. The book focuses on the changes in cancer diagnosis and the evolution of its treatment. Much of the book details Sidney Farber’s obsession to find a cure with Mary Laskar’s aid. It was easy to get caught up in Farber’s story and hope for more progress than I knew I could reasonably expect. One thing that really struck me was the politics involved in cancer research and treatment. Surgeons and Chemotherapists refusing to work together because each was convinced their treatment was the best. Politicians refusing to pass the necessary legislation. Cigarette manufacturers lying to their consumers for years. I don’t know a single person who hasn’t been touched by cancer in some way, and it makes me angry to think that these people were selfish enough to delay progress. Stephen Hoye’s narration was fine. Even though I spent a LONG time with him, I don’t have strong feelings either way. But the narrator was not as important to me as it is in other books. The story stood on its own. The book is long, but that just makes it complete. Mukherjee weaves stories of individual patients in with the history and science. It’s a good reminder that the story of cancer is not objective. It is affecting all of our lives all the time. Although the book is obviously full of loss, it ends with hope. We are making progress in the battle against cancer. And Mukherjee believes we will continue to make progress. I am listening to this one on audio right now, but it’s slow going because I never seem to have the time to devote to it. It is an incredible book though, and I am looking forward to getting the chance to finish it! Great review, by the way. It took me AGES to get through it. But worth it. I agree, narrator can be a little less important in good nonfiction (as long as it isn’t supposed to be humorous), as long as they get out of the way of the story. Hoye did that, although I wasn’t sure about him initially. I didn’t think this book sounded interesting at all when I first heard about it but I’m changing my mind. It makes me think of The Immortal Life of Henrietta Lacks because that was sort of science-y too but I loved that one. You should do that one in audio too, the narrators are FAB. I couldn’t believe the politics involved either. It’s disturbing to think of what could have already been accomplished if that wasn’t an issue. Great review! I have been interested in this book for awhile now. I am hoping to read it this summer, but I don’t think I can listen to it. My husband had cancer, and I think this one will be one of the books that I have to take breaks from-to avoid emotional meltdowns. I imagine it will be difficult. My mother-in-law is a breast cancer survivor and I watched her go through her treatment and the thought that we could be further than we are now made me so angry. I ordered and received this audio from the library, but it was on an MP3 disc and dummy me couldn’t figure out how to get it to my iPod. So I sent it back and figured it wasn’t meant to be. I think I would like it though. I like learning things. My neighbor was one of the original litigants against the tobacco companies (didn’t get a cent because of statute of limitations) and will spend the rest of his life eating from a tube. I bet he would like this book too. I hope you get to it sometime. I really need to move this one up on my TBR pile. I bet this one worked really well on audio, though I have a short attention span when it comes to audios! I hope it’s okay if I add a link to your review to the South Asian Review Database. Pingback: Book Review: #22 – The Emperor of all Maladies by Siddhartha Mukherjee | Let's eat Grandpa!